OK, it’s official… I may have turned to the dark side. If you were to take one quick glance at my Instagram, you’d soon realise I’m a white décor kinda gal with elements of scandi bohemian chic. I don’t like things looking too ‘pristine’ and ‘uniform’; instead I try and strategically place items to look strategically unplaced; creating an impression that things have been thrown together to somehow look perfectly imperfect. 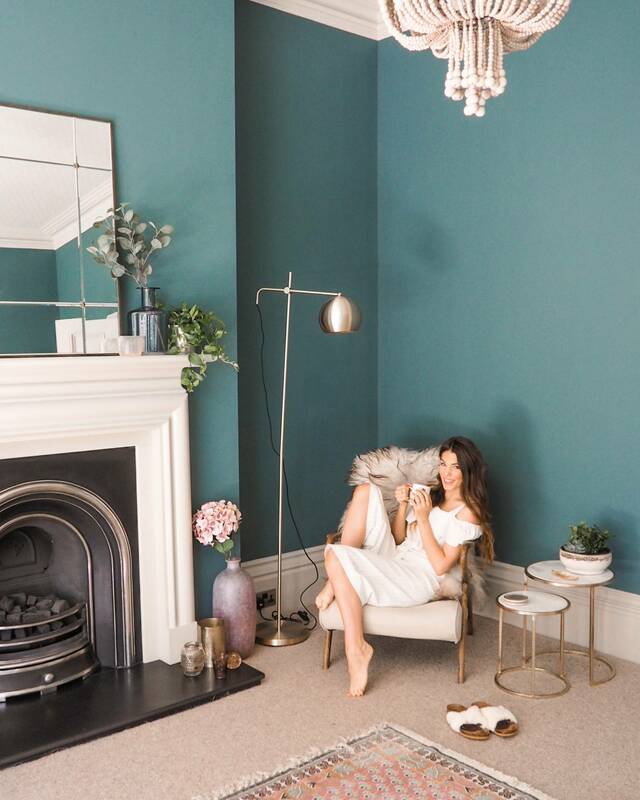 We moved into these old Victorian walls 18 months ago and have leisurely tackled different living spaces; ambling from room to room decorating and renovating as we go. Downstairs has been slow progress; it’s remained largely untouched as we came across elements of damp affecting most of the rooms (some worse than others) so that put many of our improvement plans on hold. 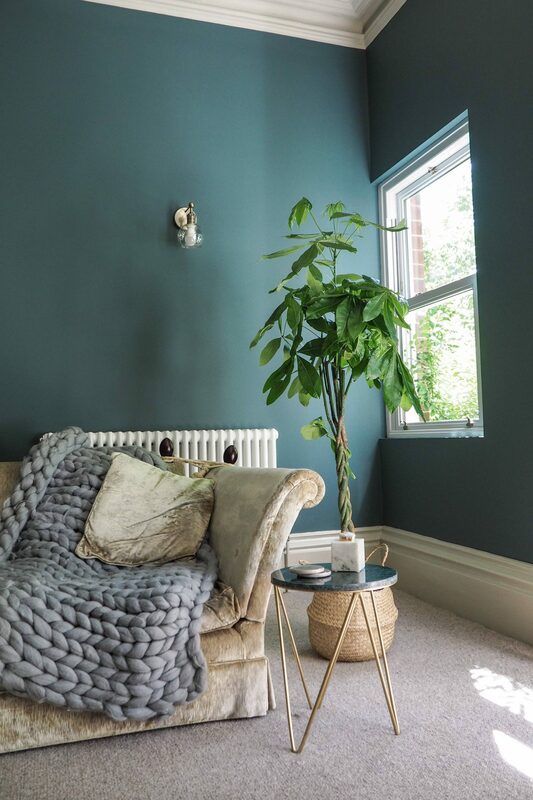 Rewind back to April of this year, a very exciting and unexpected opportunity arose to work alongside Farrow & Ball where I could lean on their expertise to restyle a living space of my choice. 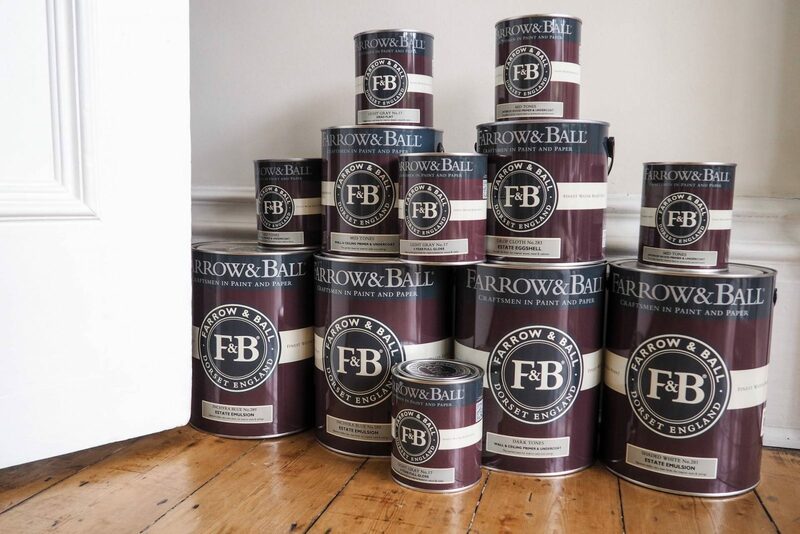 I pretty much happy-skipped around the house; I’ve always adored Farrow & Ball’s range of distinctive and high quality paints. 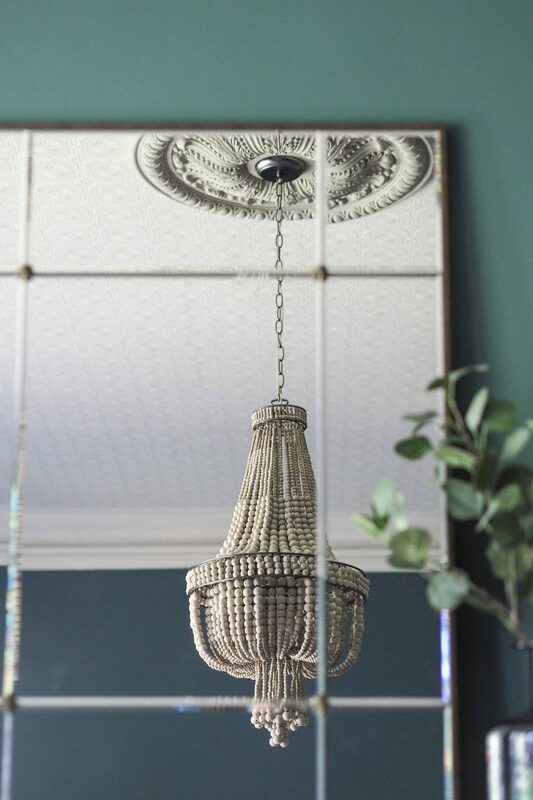 It was one of those real ‘pinch me’ moments which arrived just as I was looking to develop my work more towards interiors (while retaining the current lifestyle, fashion and motherhood perspective) so it really was perfect timing. Once everything was confirmed, it was time to begin and put on my project manager hat. I chose to renovate our ‘living room’ or ‘lounge’ as some might say; a room which I really didn’t like and subsequently spent little time in. It did, however, have great potential. Big things were about to happen, I wanted to change EVERYTHING! Firstly – a bit of housekeeping; I’ll try and keep the boring bits to a minimum. Before we could get down to business, we had to get a damp specialist guy (Andy) on the case who ripped the walls to shreds, tanked it, treated it and then plastered it. I have never seen SO MUCH DUST IN MY LIFE! It took me an hour just to clean one of the radiators not to mention the rest of the house; it seemed to spread from room to room like something out of Jumanji, coating each and every surface. Definitely dreading the damp work that’s still to come. Whilst all the damp work was going on, I was drawing up mood boards; putting together the kind of looks, colours and furniture pieces I liked. 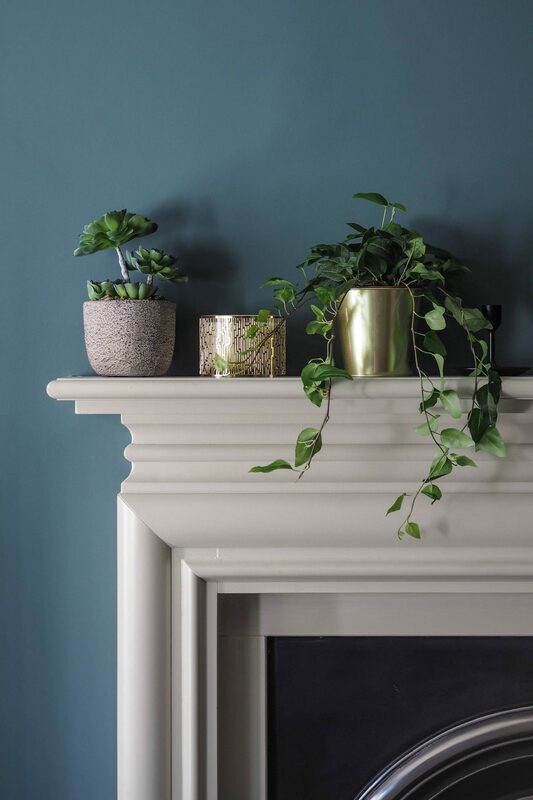 I asked to speak to one of Farrow & Ball’s colour consultants as I actually had no idea what paints to consider other than my love for white which wasn’t an option this time. It actually felt quite liberating to be out of my white-wall comfort zone. 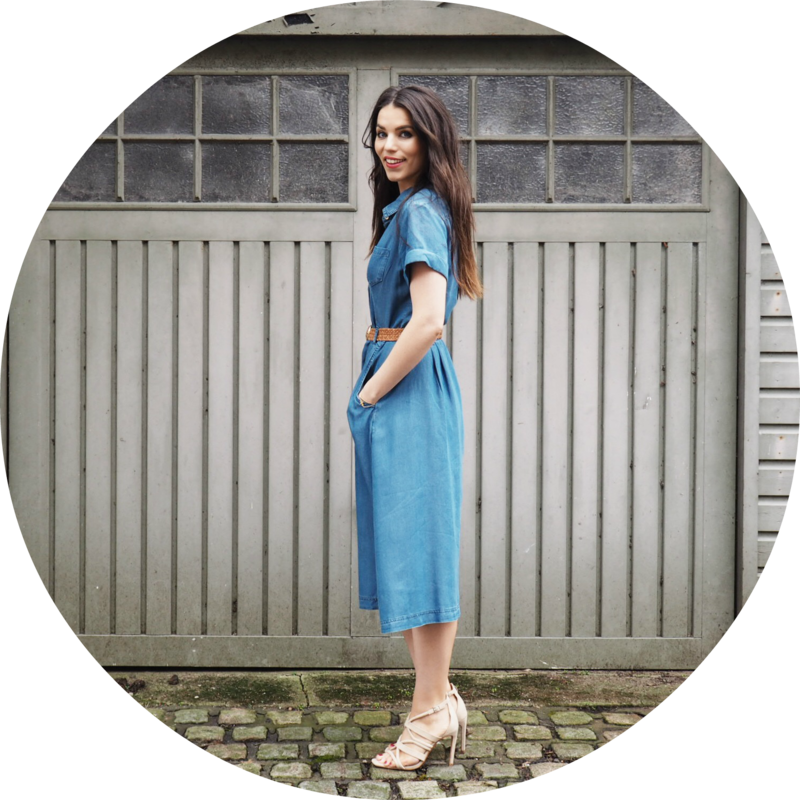 It was so refreshing talking to Kat – their colour consultant. Her knowledge and perceptiveness was a huge help to me; she knew the range of colours from back to front and how each one complemented other colours and furnishings. I sent her pictures of the space and she asked questions about what time of day the sun enters the room and from which direction; an example of things that I would never have considered when it came to choosing colours. I trusted her judgement and I thought at the end of the day, it’s only paint and if I really didn’t like it I can repaint again. More than anything, I just thought YOLO, let’s go for it! I had the colour cards in front of me as she was suggesting different colours… ‘Inchyra Blue… Drop Cloth… Shaded White’ while I was flicking back and forth analysing the palettes. I was honest with her and said I’d never even think about putting those colours together but I was ready to lean on her wisdom; she was the expert after all. We both sat on it for a couple of days while I tried to imagine the space in these new colours… and then the decision was made. We were going to paint the radiators Light Gray too but when it came to it, it transpired that they’re powder coated (like how an oven is painted) which basically means you can’t paint over the coating so they had to remain white. This doesn’t look too bad actually because the windows are still white so it ties in with them. 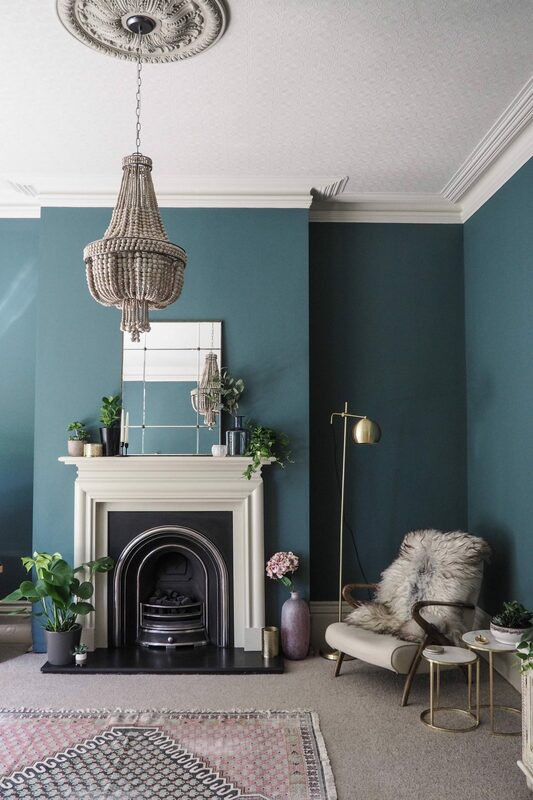 For the walls, I chose the Estate Emulsion as I prefer a matte look but you can opt for Modern Emulsion which gives it a slight sheen and means that it’s wipeable. Fingers crossed the boys will keep their mucky fingers off. 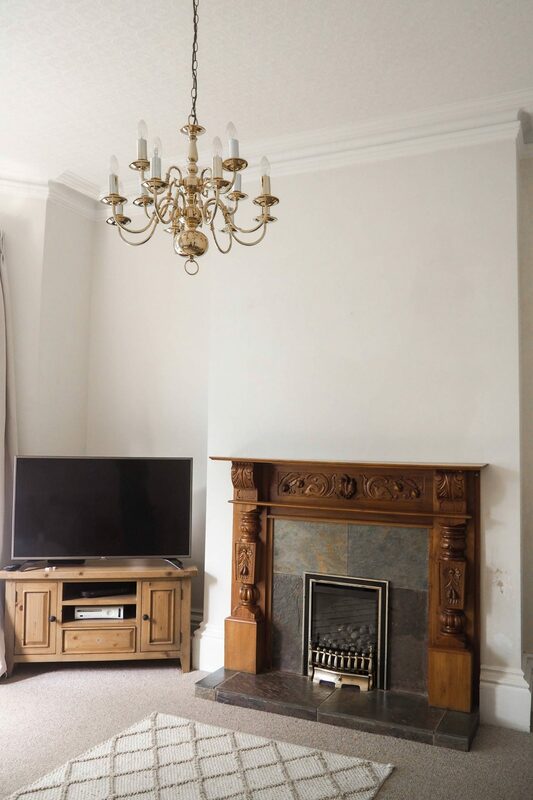 Before painting, I chose a gorgeous new fireplace from a lovely local company called Gillibrands who fitted it for us too, it was like a dream come true as I’ve always wanted a traditional fireplace like this. 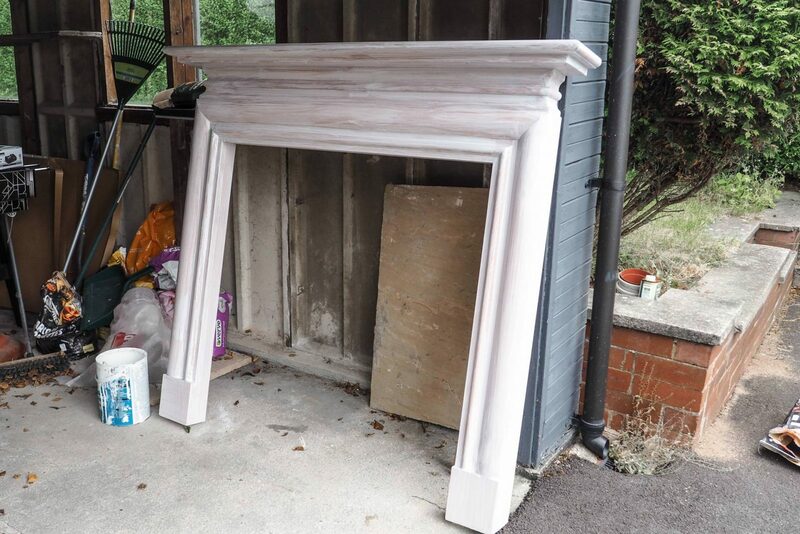 I was going to keep my original fire surround and paint it as I was struggling to afford some of the modern surrounds I kept seeing. 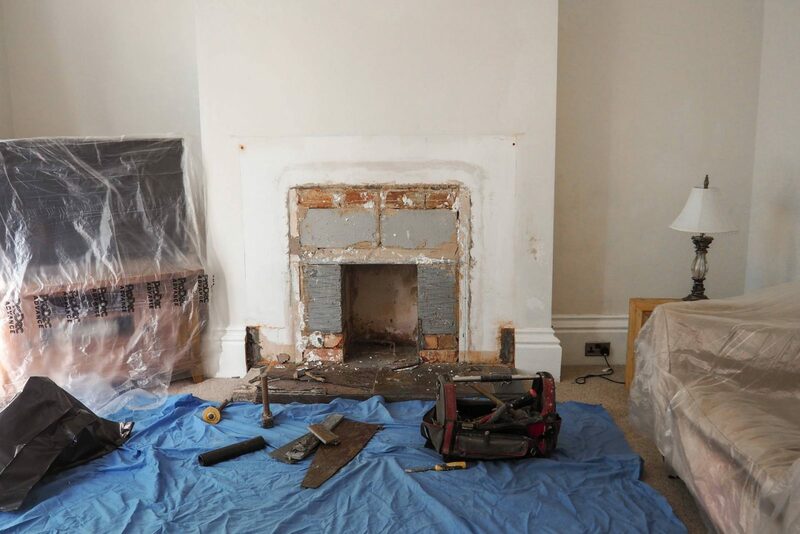 But when we put the existing surround up against the new fireplace, it didn’t look right so it was time to hunt one down that would suit the space – and we only had three days to sort it! Thankfully I managed to find one I liked at Ribble Reclamation (it was only £100) and although it was an orangey wood I could see the potential of it once painted so I went for it, there was literally no time to waste. 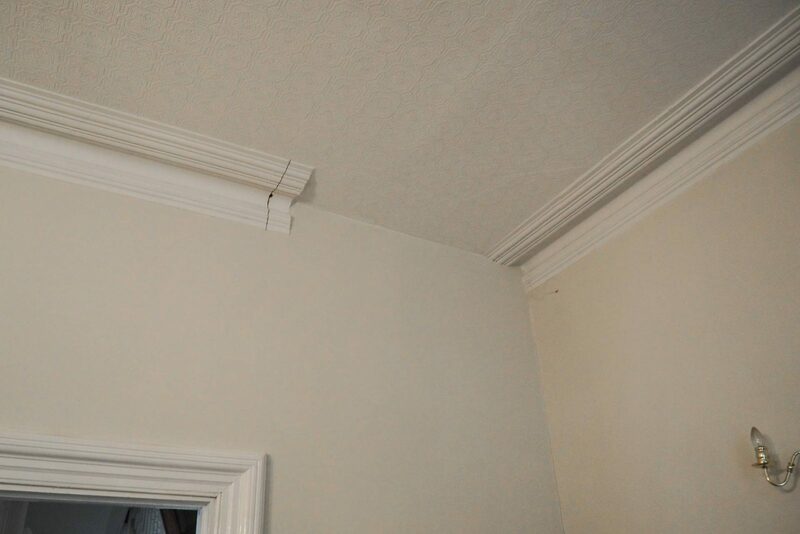 In the meantime we also had to get some of the ceiling cornice patched up as there was a huge gap in the coving where – I think – there once used to be an opening into the hallway. 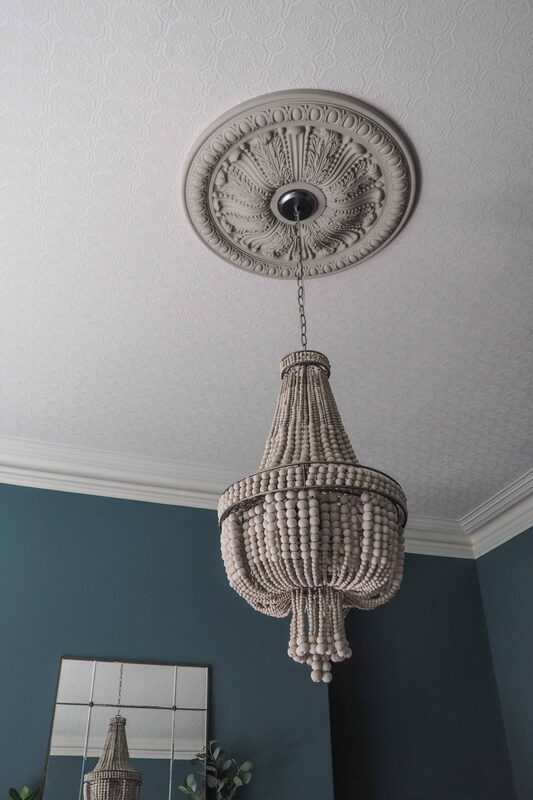 I also bought a ceiling rose to add a feature point above the light fitting; I also thought this would complement the high ceiling Victorian feel of the room. I felt like this living space had finally become ‘mine’. Beforehand, it almost felt like I was living in someone else’s lounge. 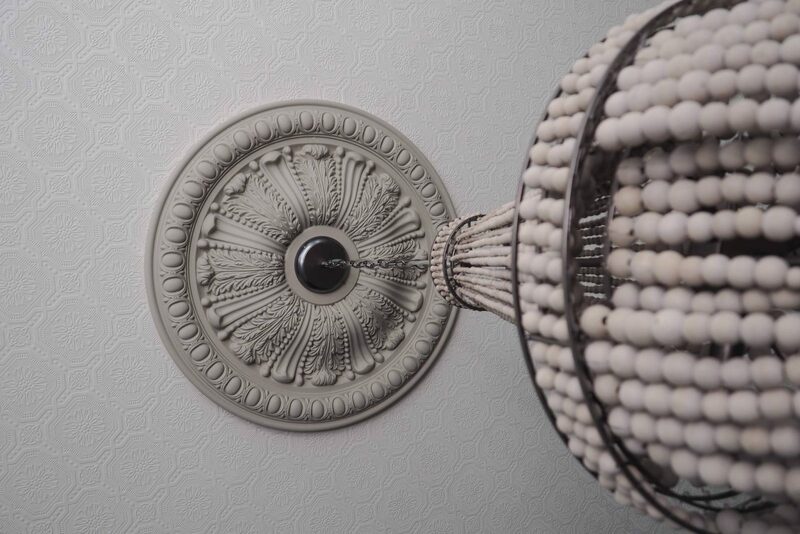 The new ceiling architecture painted in Light Gray and the statement light fitting that sits within it. 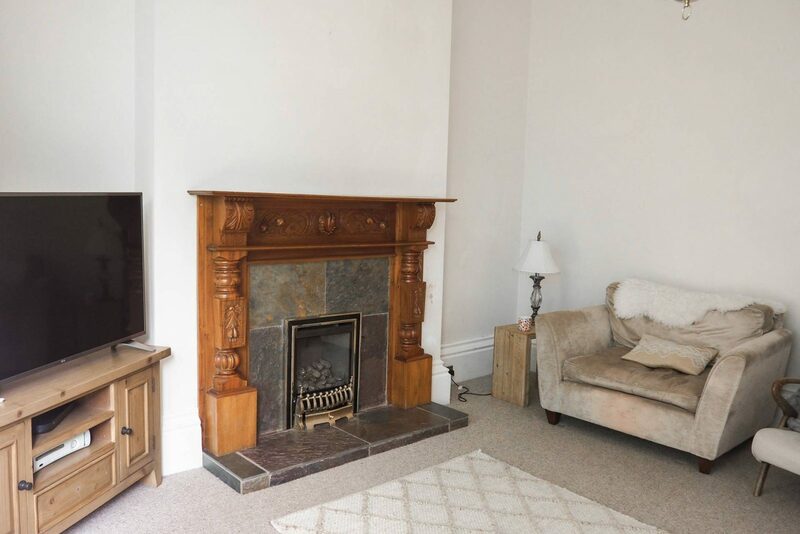 I love that it’s restored some of the old Victorian charm and character into the room and if your eyes aren’t drawn to the fireplace, they’ll certainly be looking skywards instead. Seeing this room come to life was something I absolutely loved. The colours accompanied each other perfectly! Even my decorator, Ken, said that he wouldn’t have initially put the colours together but conceded that F&B certainly know what they’re doing as it looked great! 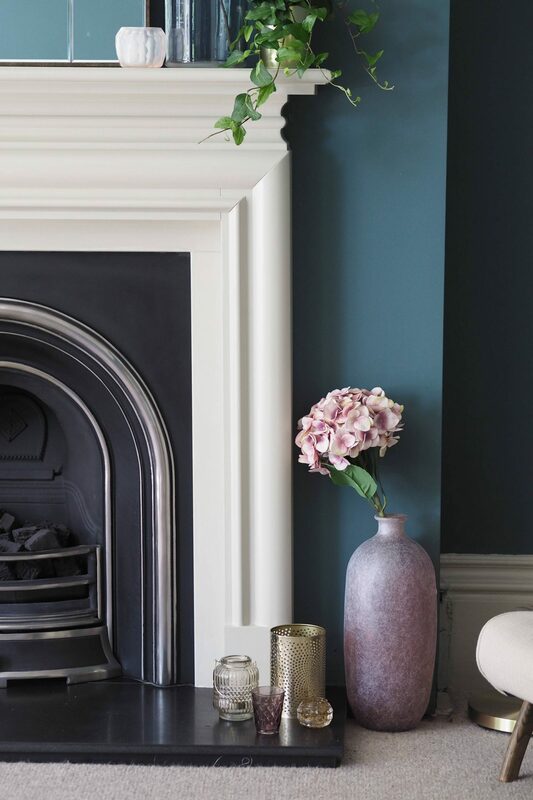 For the accessories I went with a colour palette of greens, blues, golds and dusky pinks which all really complement the Inchyra Blue walls (again I had Kat to confer with – she was amazing at picking out colours to complete a living space). 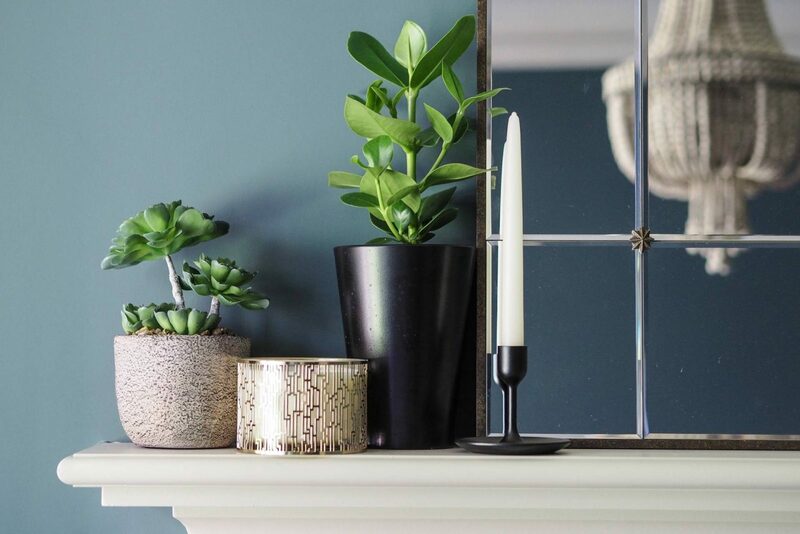 A home isn’t a home without… plants! In my opinion, of course. 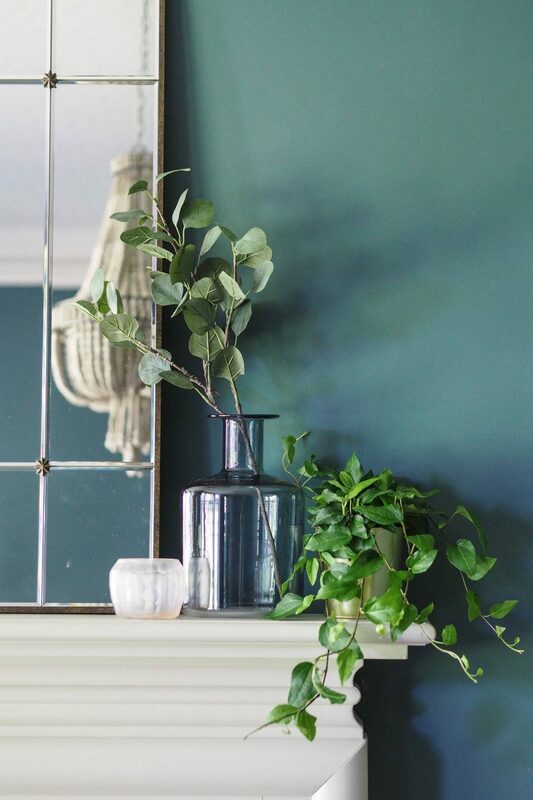 Even though I struggle to keep them alive, I love how plants bring style, colour, shape and clean air into their environment. 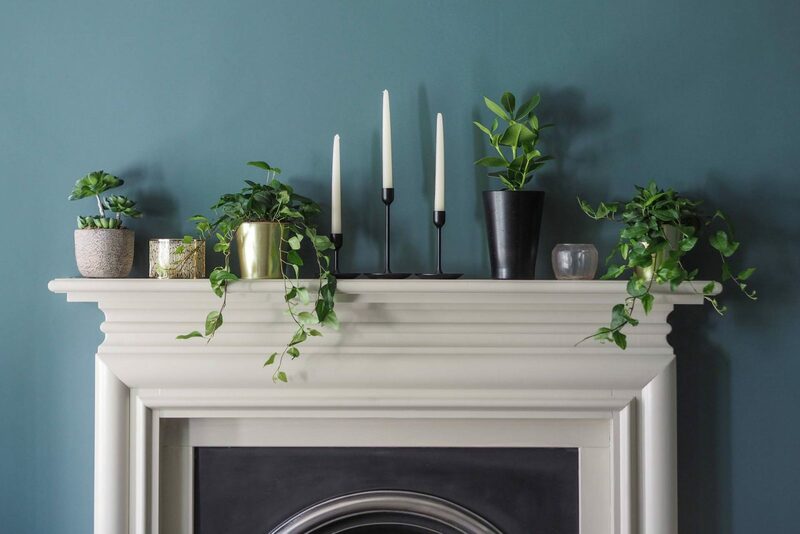 I can’t stop looking at the fireplace area as a whole with the painted colours, the plants, vases, candles and the feature mirror on top – I honestly and wholeheartedly love it all and I’m feeling a little proud of what we’ve managed to create! 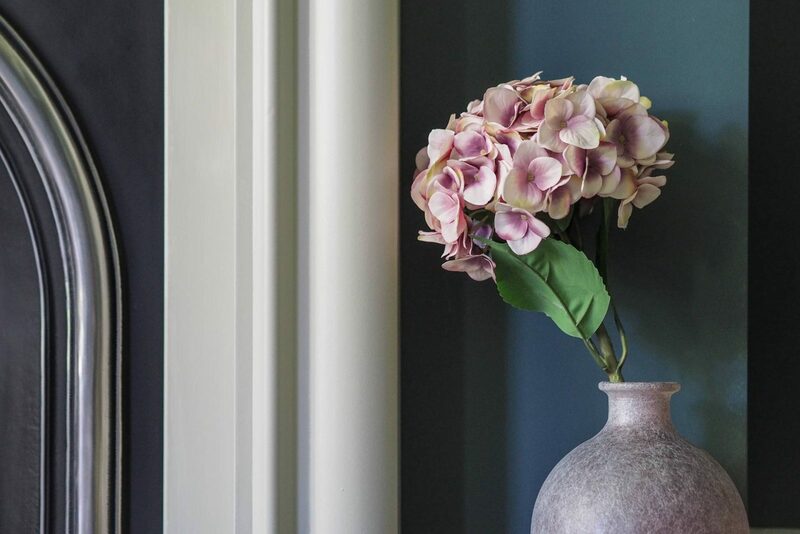 I adore how the Inchyra Blue colour seems to change shades throughout the day, sometimes it looks greener and then other times it looks really blue – I love it. Interestingly, I thought it may ‘feel’ cold but it doesn’t; it feels really homely and snug. It’s definitely worth mentioning some feedback from our decorator Ken, too, who works with different paints on a day-to-day basis. 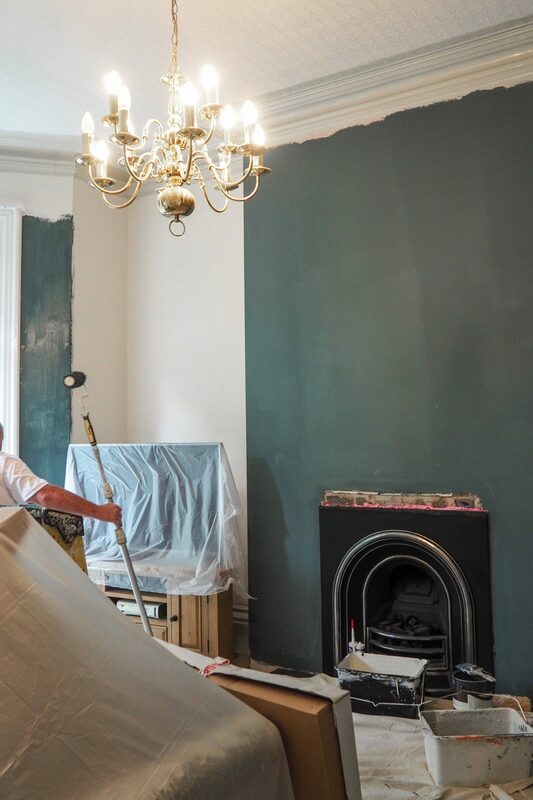 He said he loves using F&B paint as it’s high quality and even though there are cheaper brands out there who try to imitate and colour match F&B, in his words they ‘never come out the same and you can really tell the difference in quality’. Always good to get the perspective from someone who knows what they’re talking about! 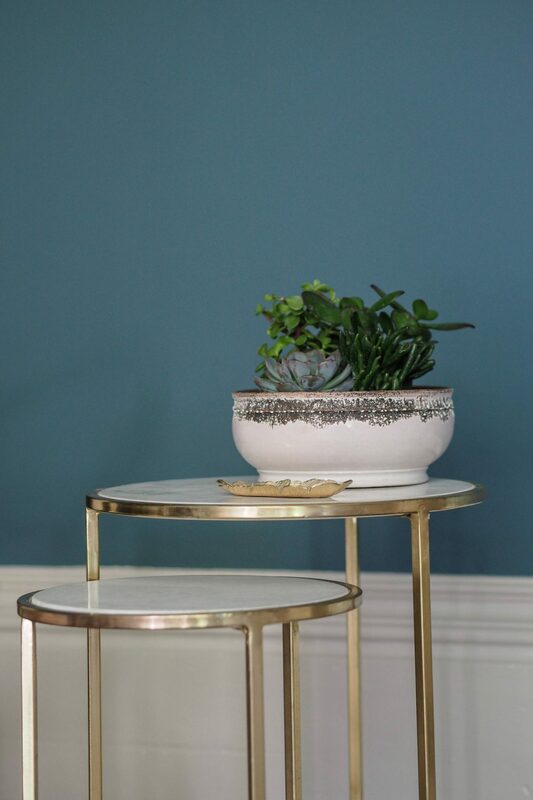 I’m going to do another blog post with links to where I got all the accessories from and hopefully by then we shall have shutters, new sofas, new TV stand and maybe a pink chair and also some gold shelving to style in the corner – eek! Exciting times ahead… my mind is already running ahead to Christmas and how I can’t wait to dress the room for the festive season haha. 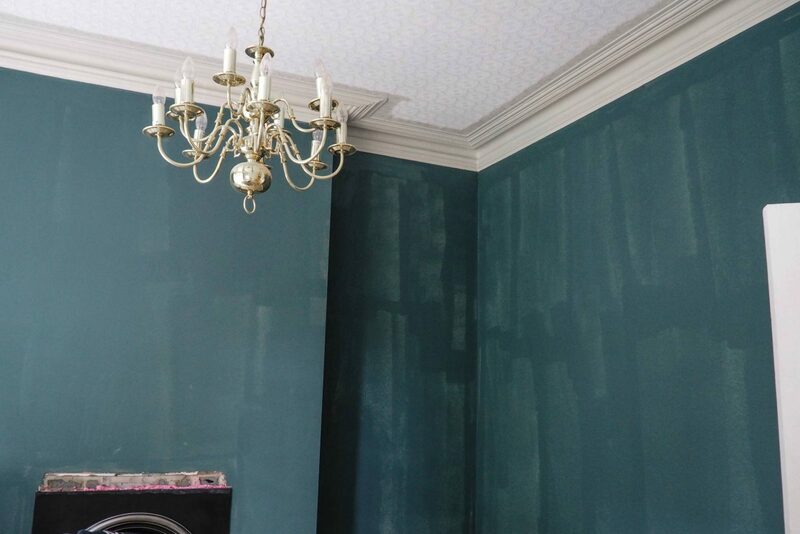 I want to say a big thank you to Kat and Farrow & Ball for giving me this opportunity but most of all giving me the confidence to go for a colour that I would never have chosen otherwise. I’m now thinking what else I could decorate and to have fun with pushing my own boundaries because you never know, you may just love it! I’m proud to say this post was kindly sponsored by Farrow & Ball. As ever, all thoughts and opinions are my own. I only blog about brands, products and services that I truly connect with, would genuinely use, and would legitimately recommend to others.